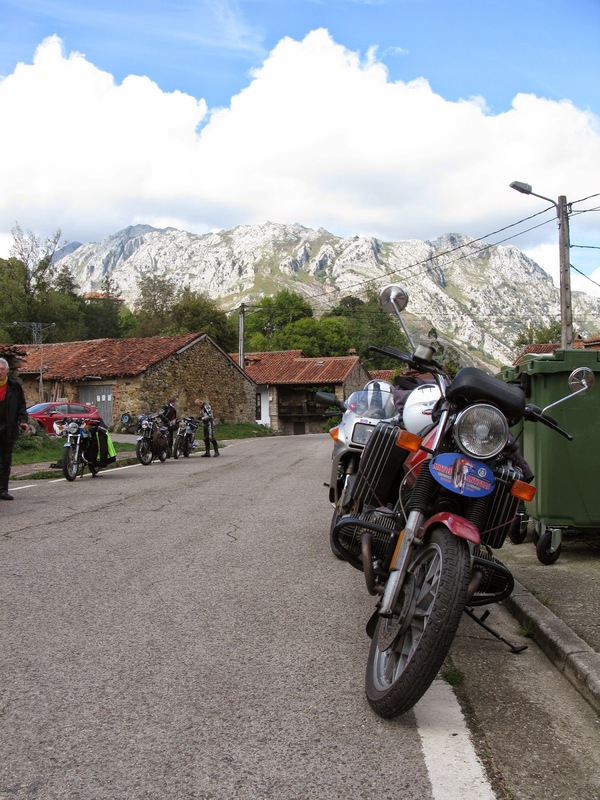 The first day of the Picos Tour through the Picos Europas. 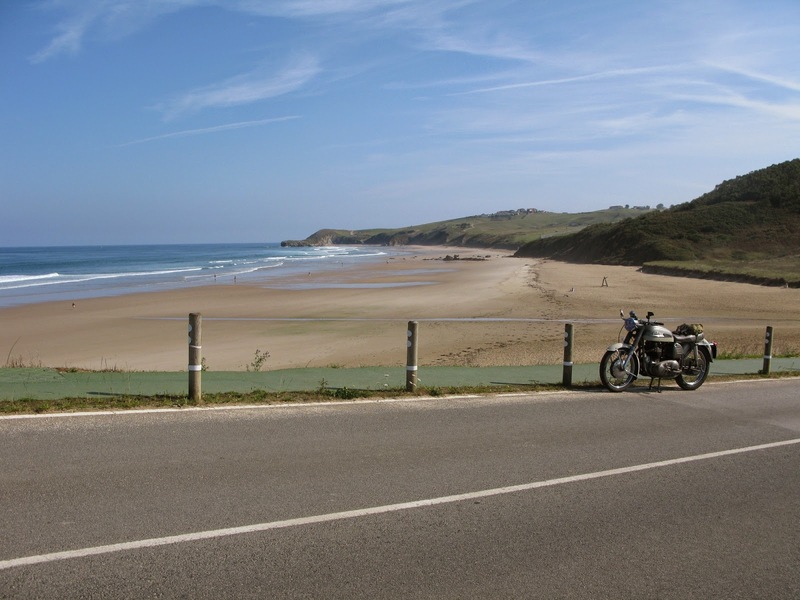 It took a while to leave the coastal urban sprawl but the effort was worth it passing first fabulous surf beaches and then winding up into the mountains for breathtaking scenery. The day finished up in Potes for an overnight stop with the now customary huge meal! 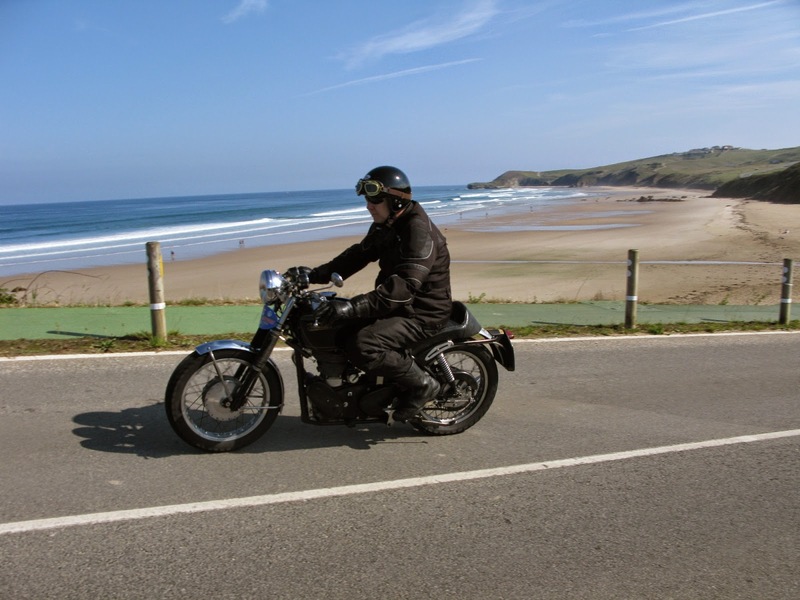 Norton Dominator 99ss at the seaside admiring the view. 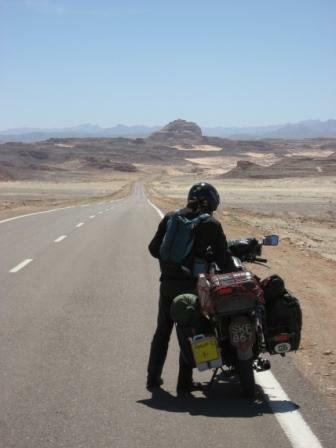 A pre-unit Triumph passes by. 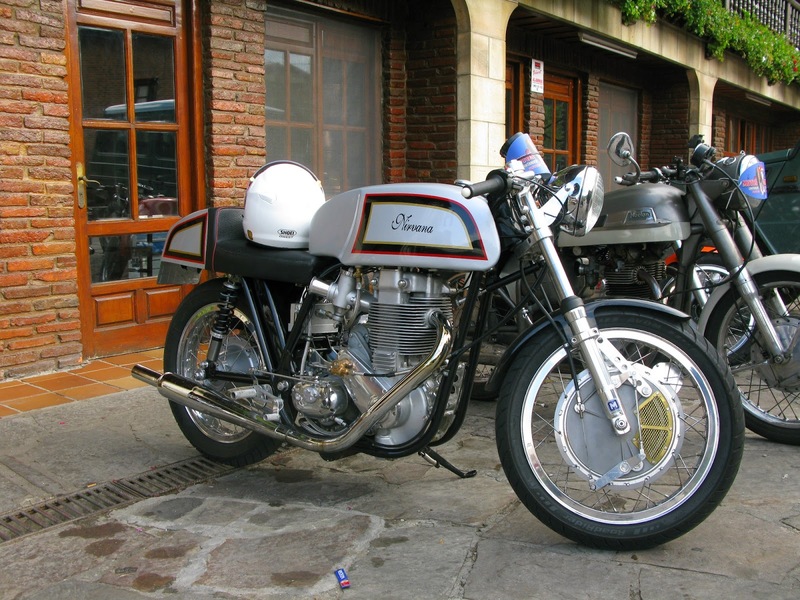 And then a Velocette Venom. 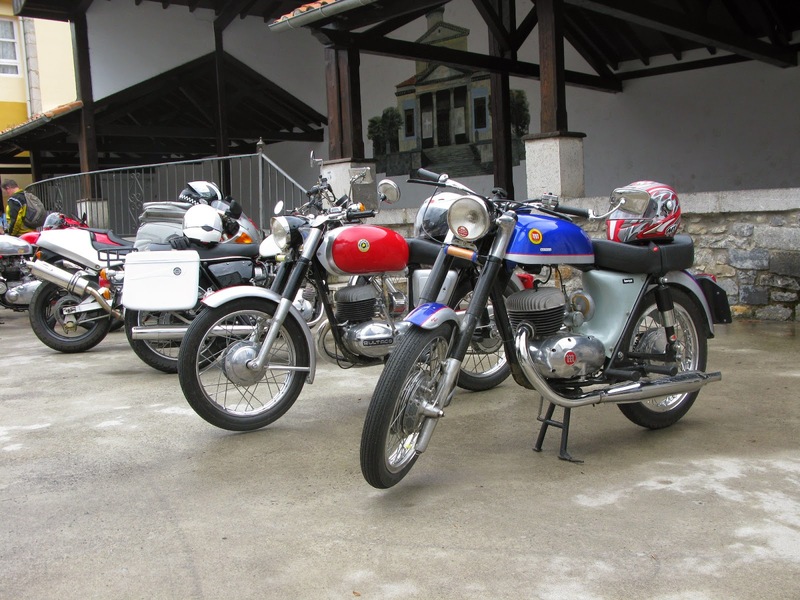 Classic bikes take over mountain village. 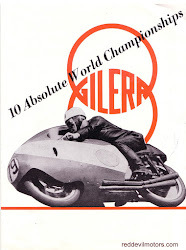 Gilera Saturno visiting from Holland. Pearson 600cc motor and a lot of very trick parts. 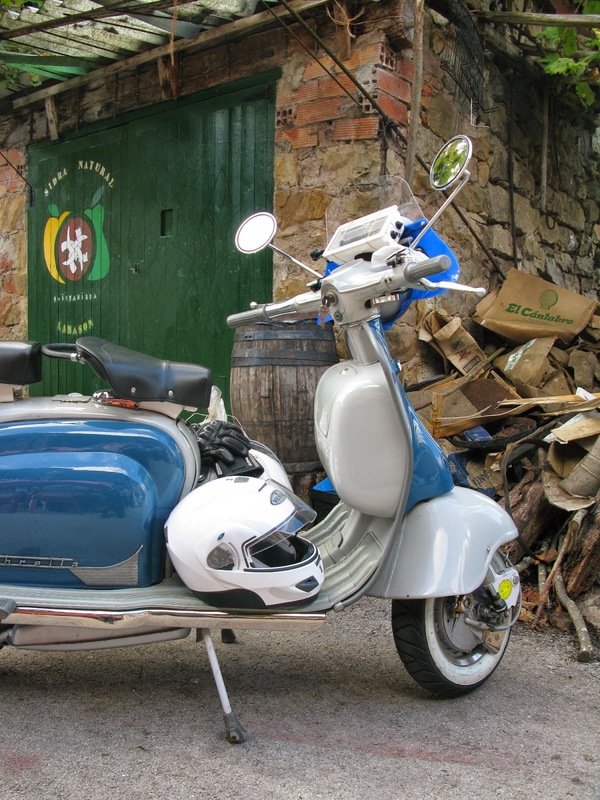 There's even a couple of Lambrettas come along. Another Dutch visitor. 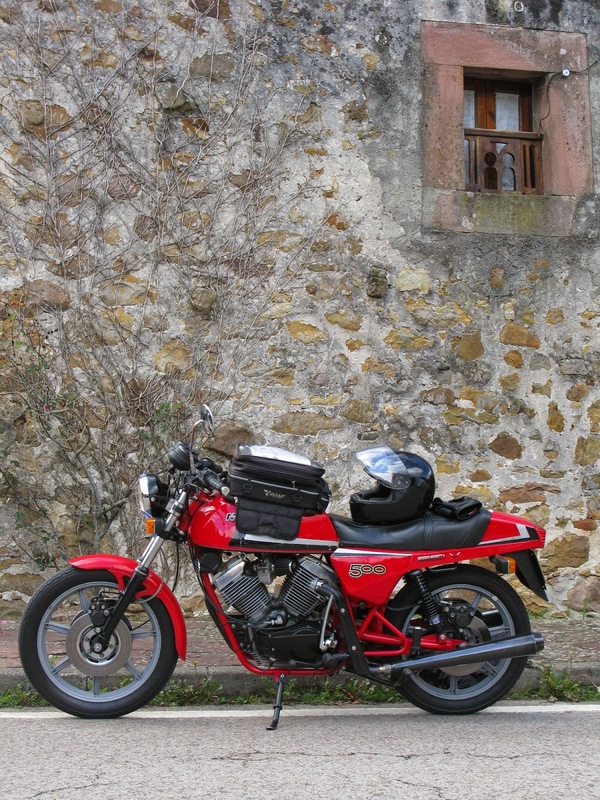 This one a Laverda triple. Sunday, I'd thought this was a free day but there was a run organised. A nice bonus. 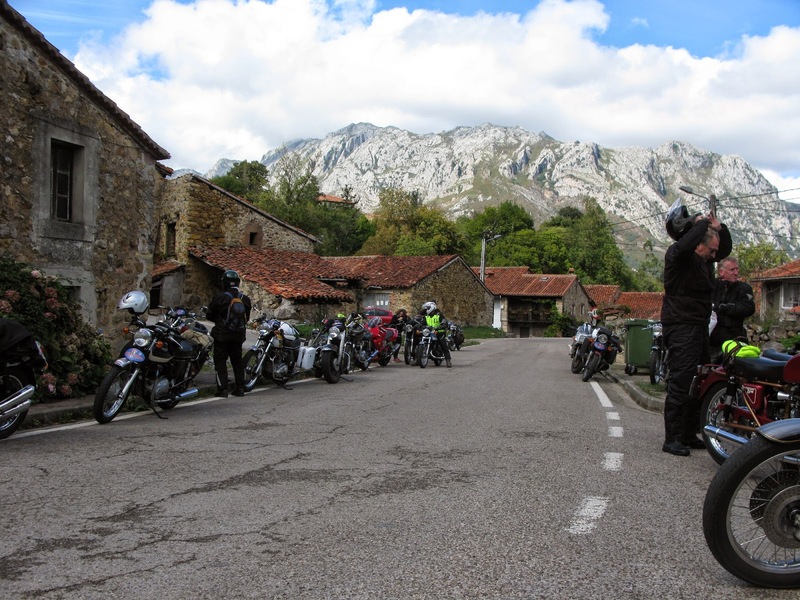 A cracking ride through the mountains, perfectly route marked, that ended up with a paella by the sea. Perfect. 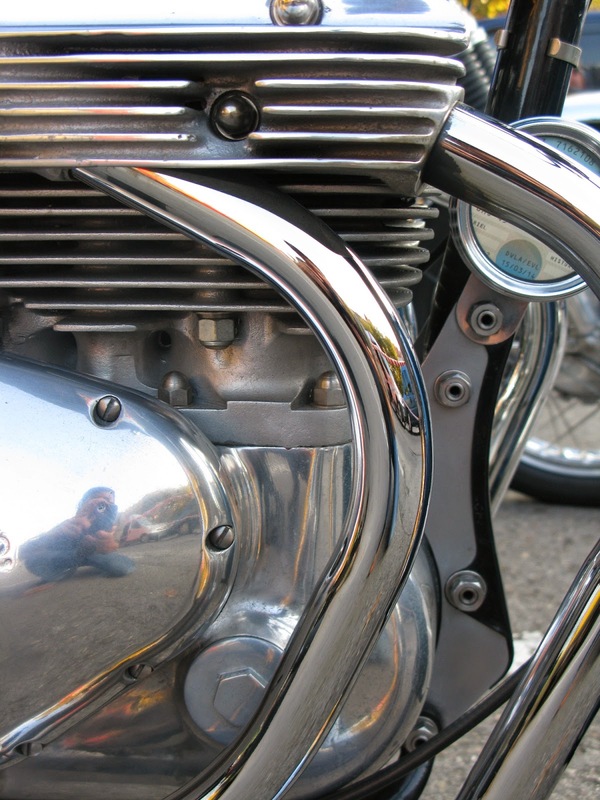 it is mounted down low under the swinging arm. 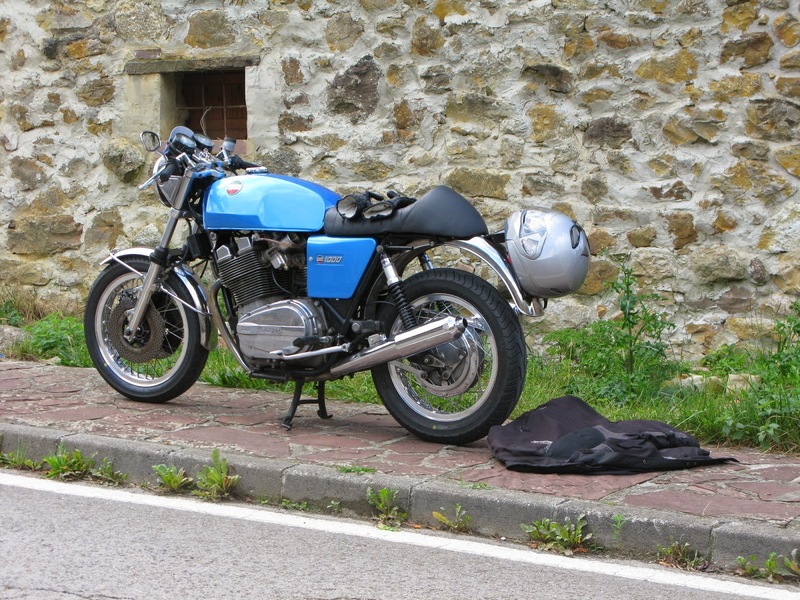 Another view of the Guzzi. a change from Italian iron. 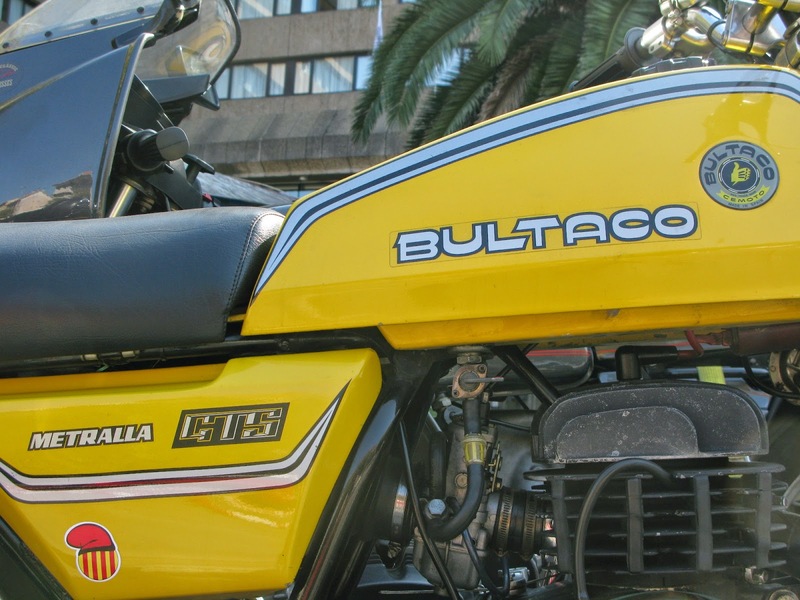 Bultaco and Montesa road bikes at the coffee stop. I've never seen one of these before. 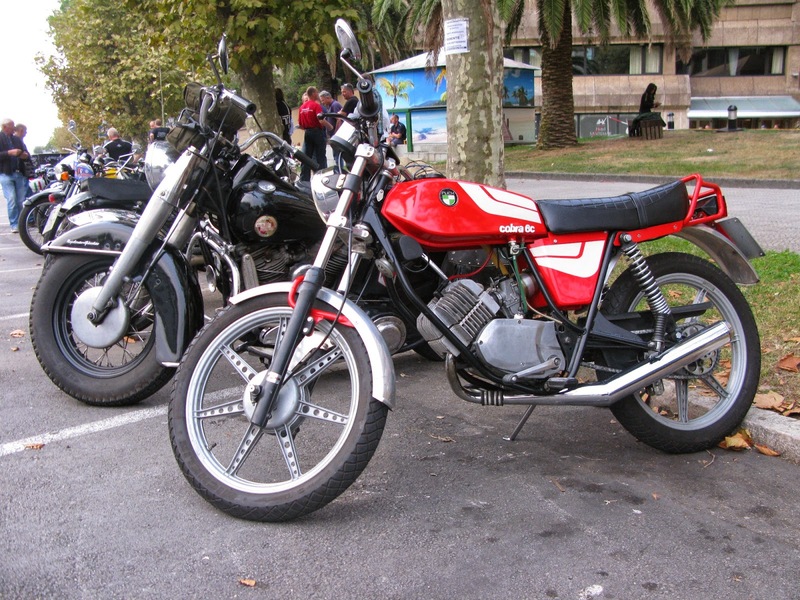 A Puch 75cc Cobra 6c. look at the drilled through engine plate studs. 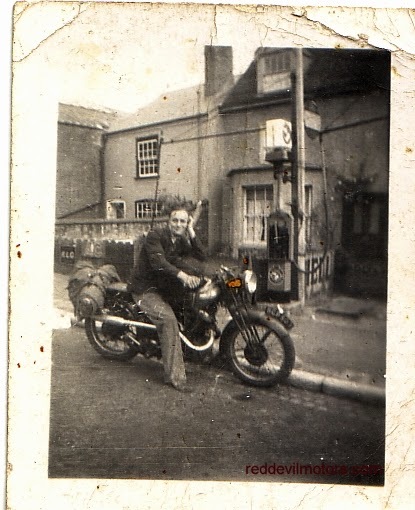 Vincent Black Shadow on the road. One of two in the event. 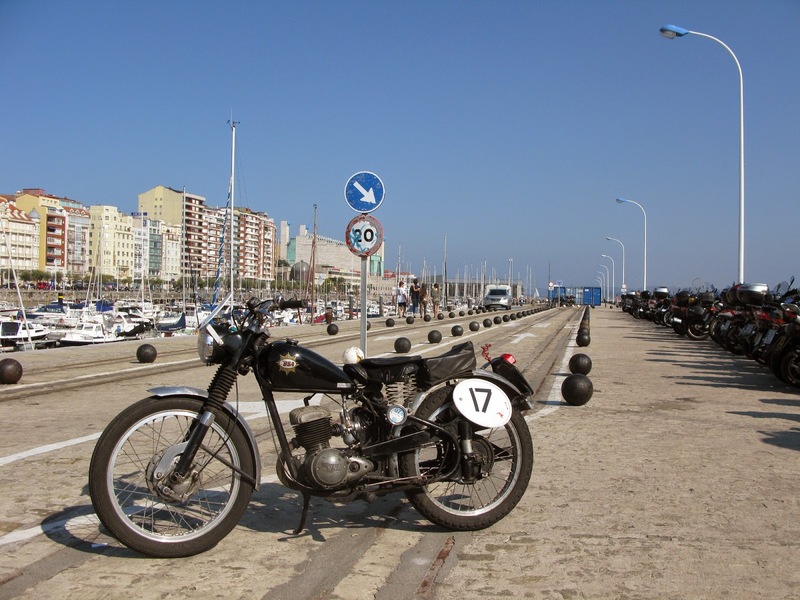 Arrived in to Santander for the MC Piston Rally in the early hours after a twelve hour drive down from Cherbourg. 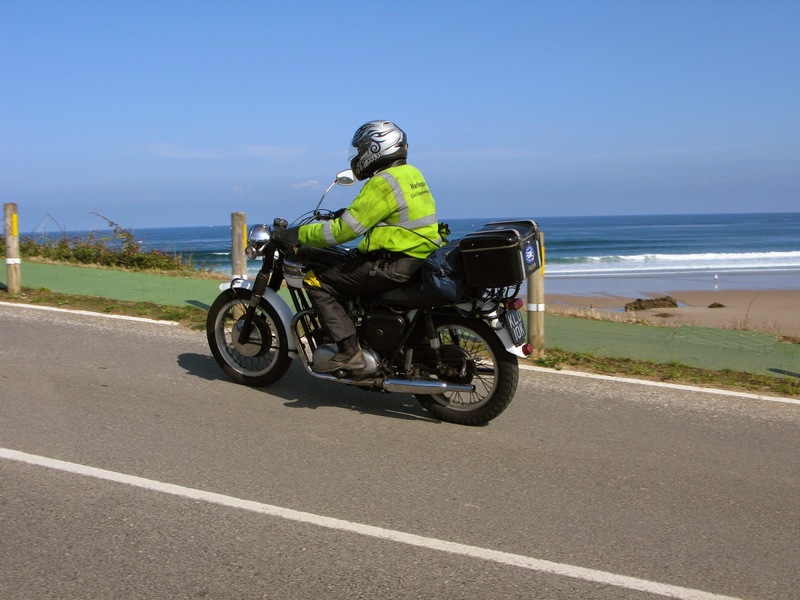 A free day so relaxed and took the Bantam for a spin around town. Other folks started to arrive late afternoon. Marina photocall with the Bantam. eye and looks like a lot of fun. Another detail on the Metralla. 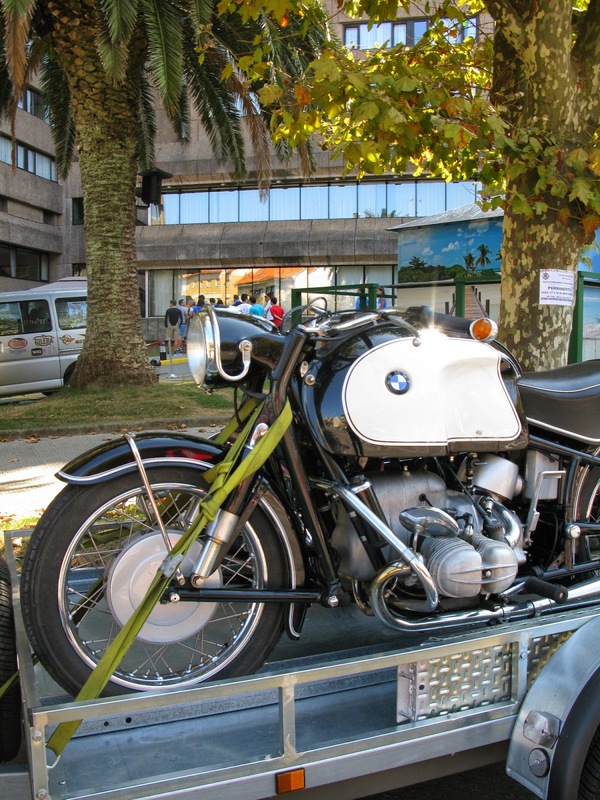 Montesa Impala and BMW R90s just arrived. 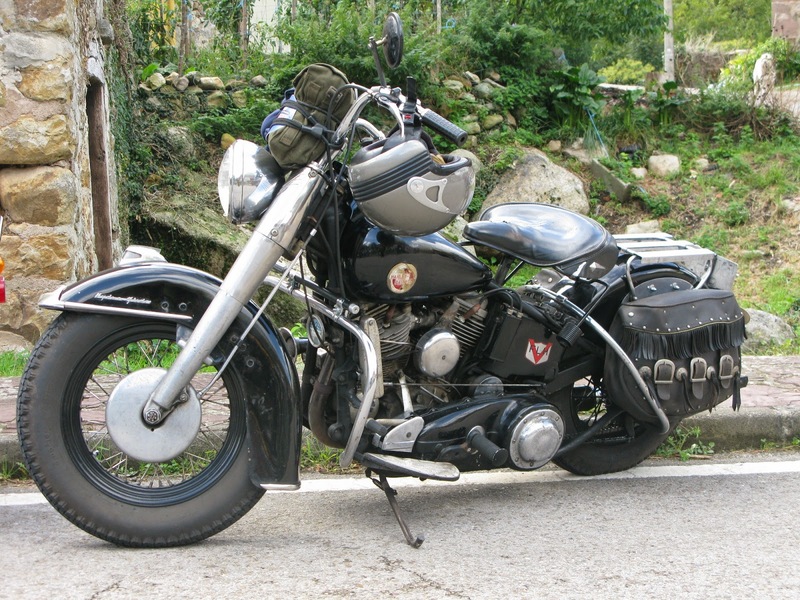 1930s Panther ready for a long journey. 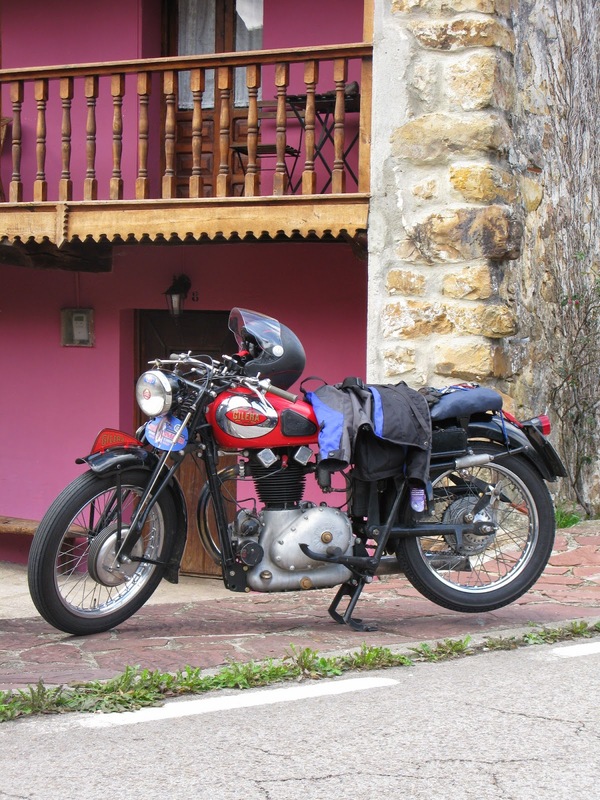 The trusty Bantam, veteran of two Moto Giros and several VMCC sprints, is being prepared for a jaunt down to Spain (not under its own steam, that would be pure masochism) for the MC Piston Santander Rally. 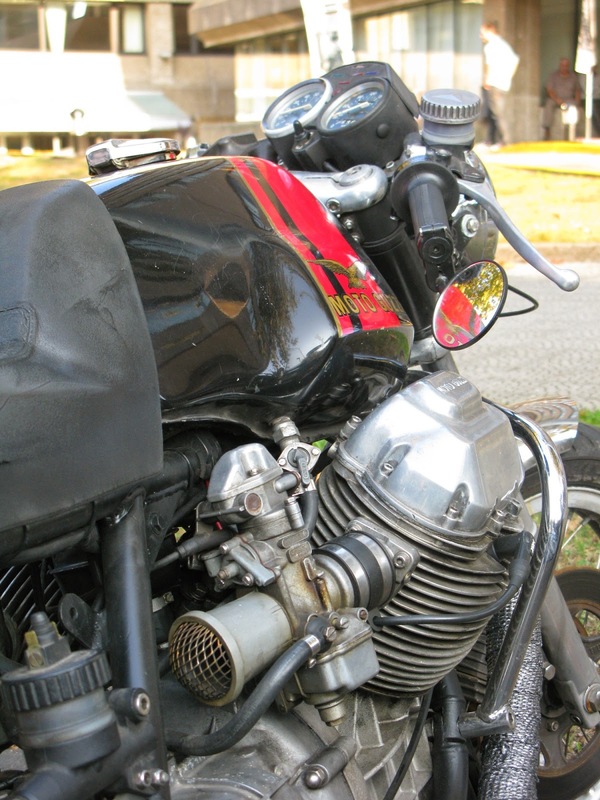 A couple of the special parts on the bike came from Peter Savage, namely the CDI ignition and the MZ conrod conversion. Both have given really excellent service. 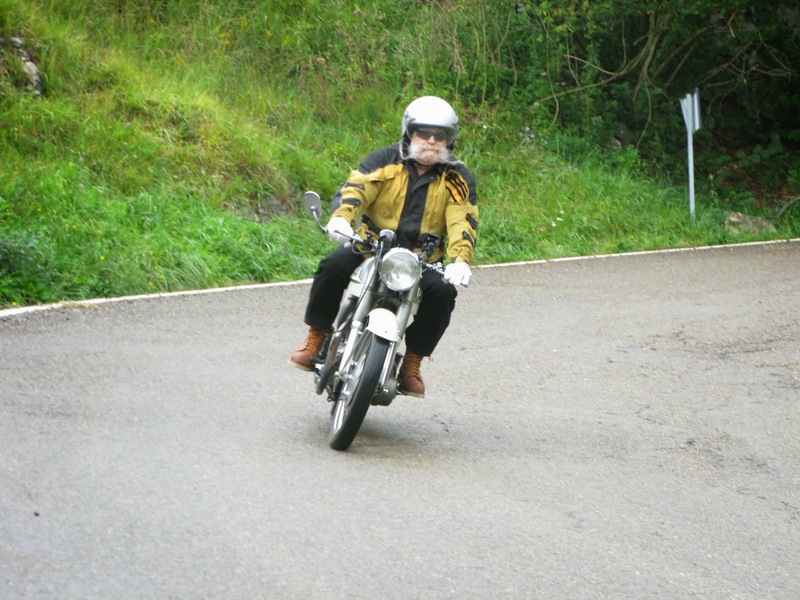 A while back the clutch started slipping so I got in touch with Peter to buy one of his eight spring clutch conversions. The delivery time was a few weeks so at the same time I bought a set of extra strong springs from Rex Caunt. Life being as it is the stronger springs were fitted, they worked and then the eight spring conversion arrived. The conversion has sat on a shelf in the workshop for a good year. I always knew that I should get around to fitting it though, the stronger springs are an effective but slightly brutal solution, a harder pull at the lever and more stress on the system. 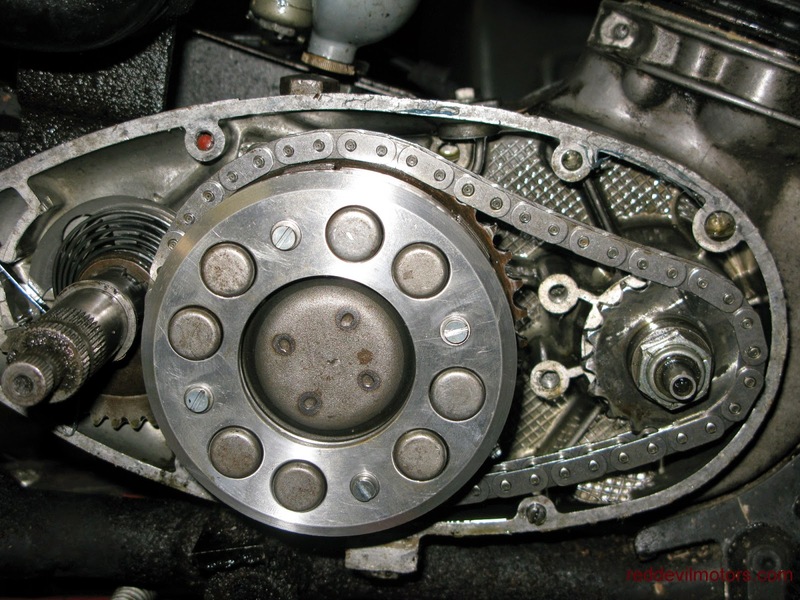 The eight spring conversion is certainly the engineer's remedy. 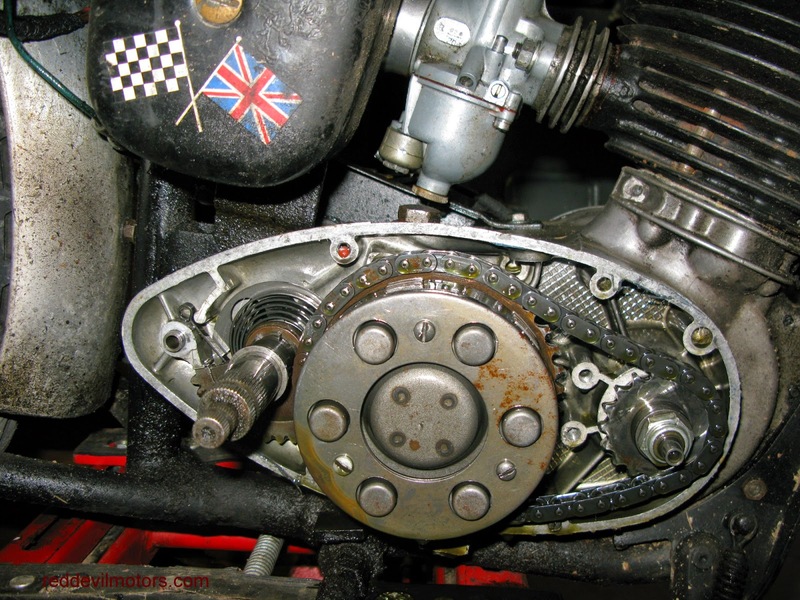 Once fitted though the eight spring conversion is a useful piece of kit,. There's no slip and the clutch maintains a nice light action. The same conversion fits all models of Bantams. Thoroughly recommended. 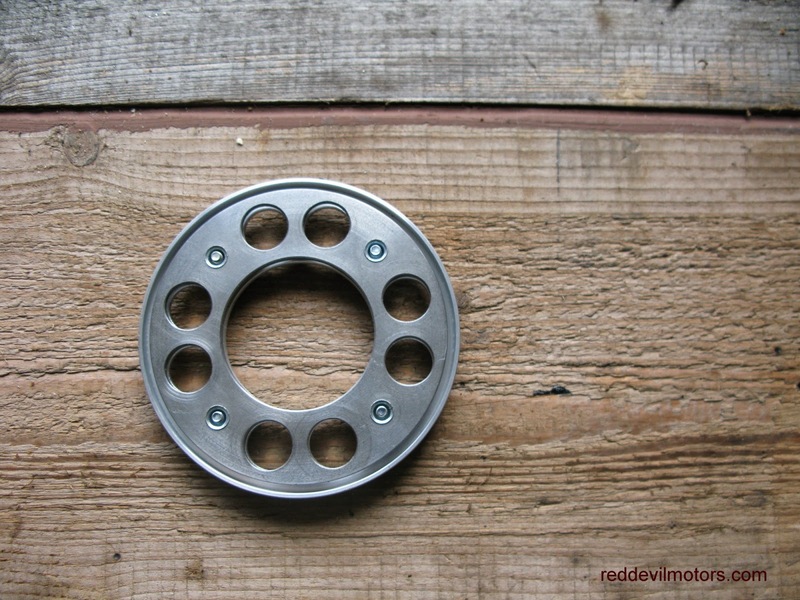 Bantam eight spring clutch conversion outer plate. 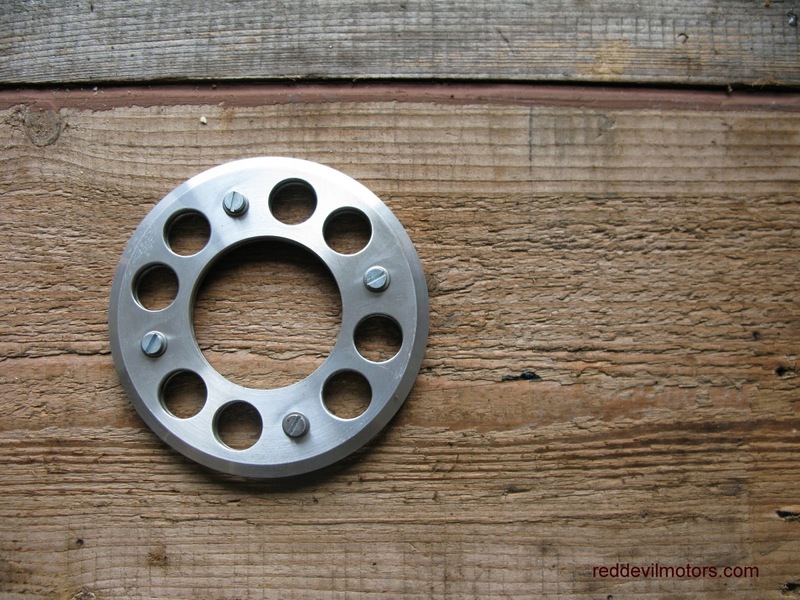 Bantam eight spring clutch conversion inner plate. After - eight springs and a shiny machined aluminium cover. 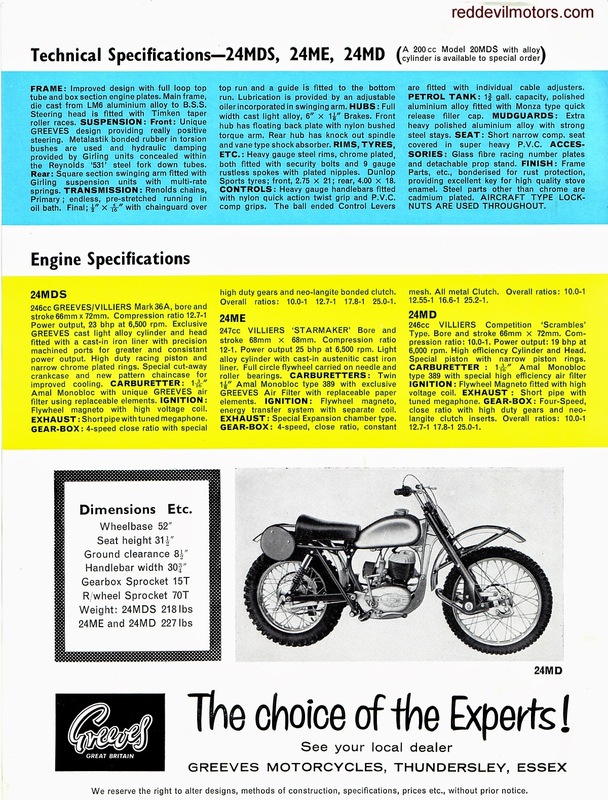 Two page brochure for the 1963 Greeves 24ME, 24MDS and 24MD scramblers. 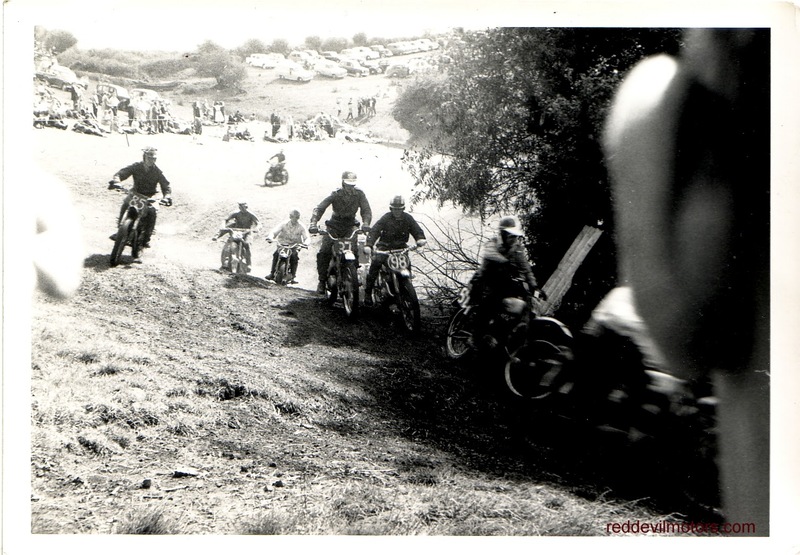 Greeves Scramblers brochure 1963 page 1. 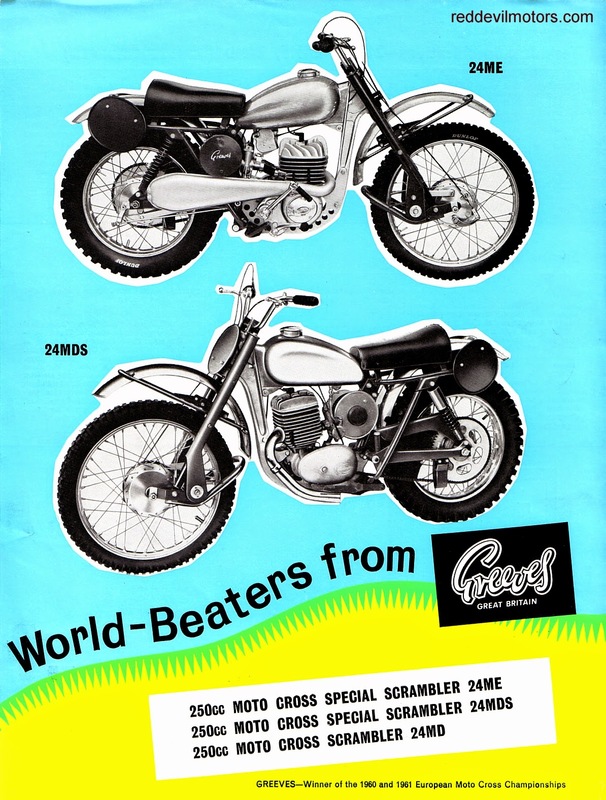 Greeves Scramblers brochure 1963 page 2. 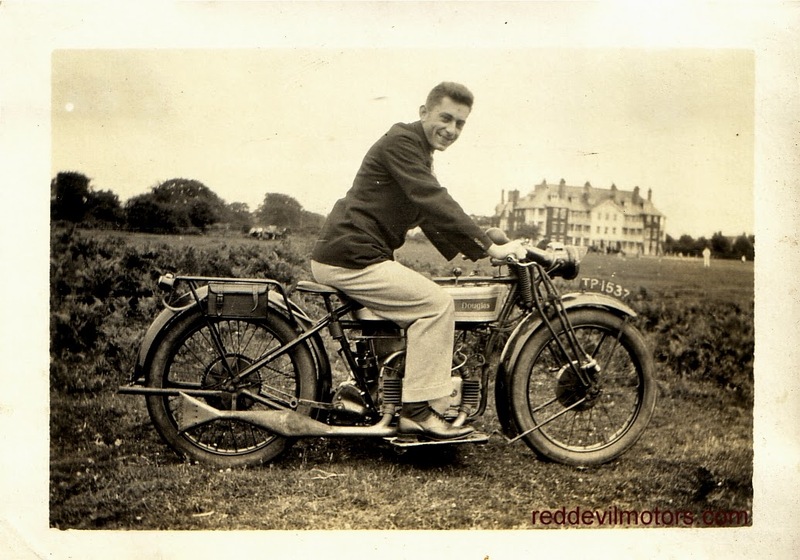 Content on Red Devil Motors has been growing and growing - 308 posts and counting. Navigation around content on a blog is always a bit of a problem but current content is the nature of the beast. There's the tag cloud on the right hand bar but there are only so many tags you can use before confusion reigns. 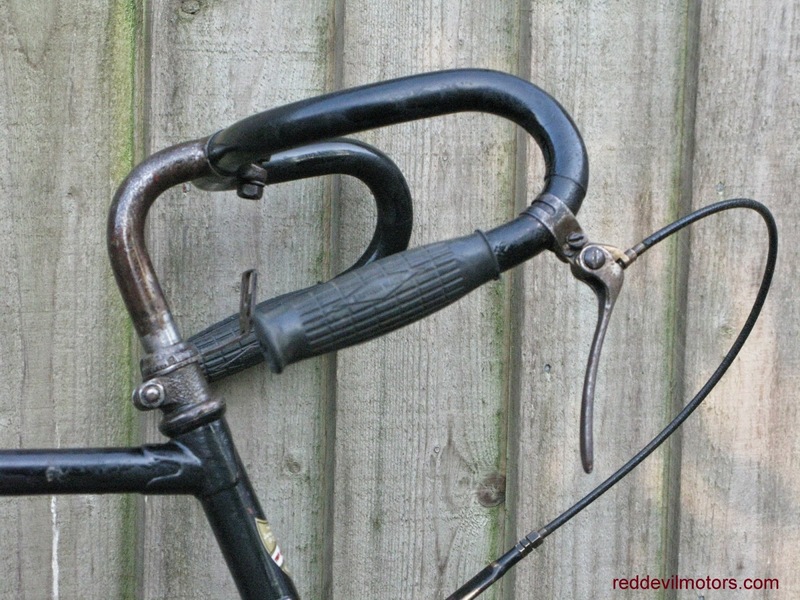 To cut the story short I've decided to henceforth put all bicycle content on to a separate new blog. 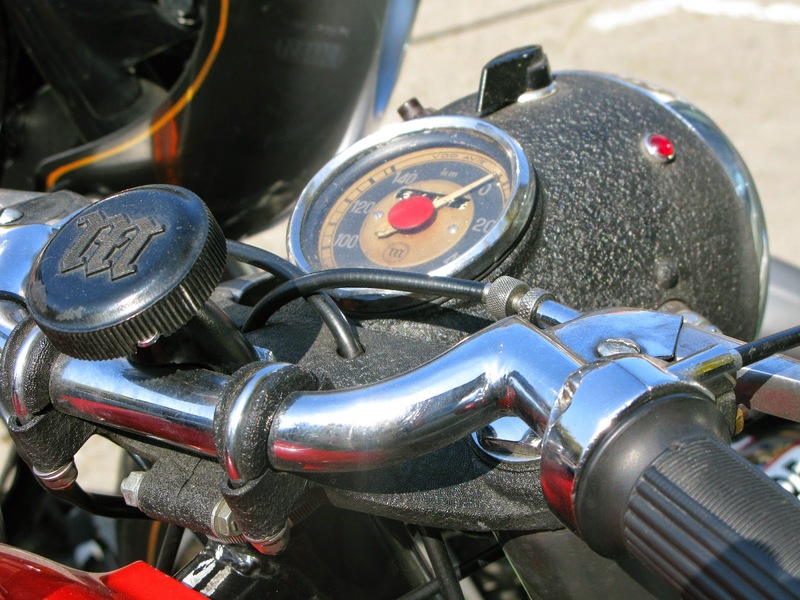 Personally I enjoy running a blog that is so eclectic in nature, however I appreciate that there are not so many folks out there deeply in to both vintage bicycles and motorcycle so it seems like the right thing to do now is to go more specialised. 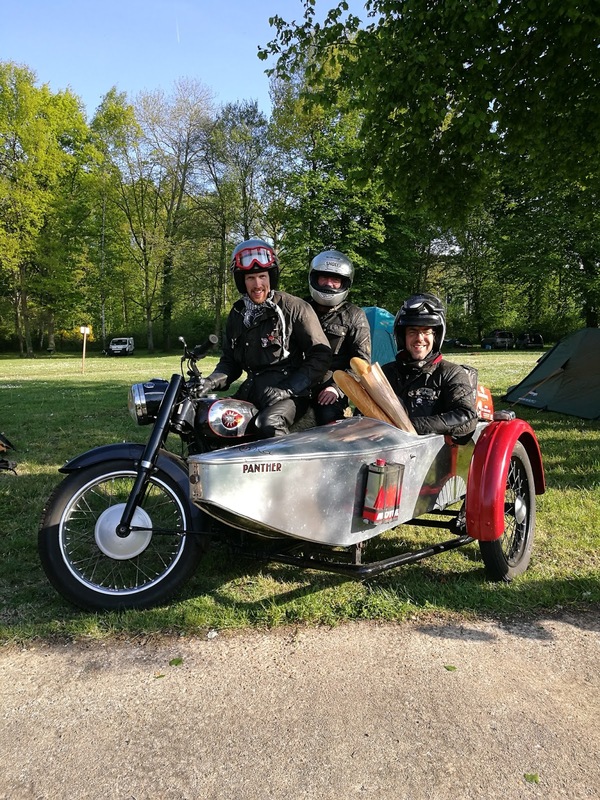 Vintage Bicycling will follow the same formula as Red Devil Motors - vintage photos and brochures, rides and events, mechanical woes and workshop tales. For now the Red Devil Motors Facebook page is going to stay with both pedals and engines. 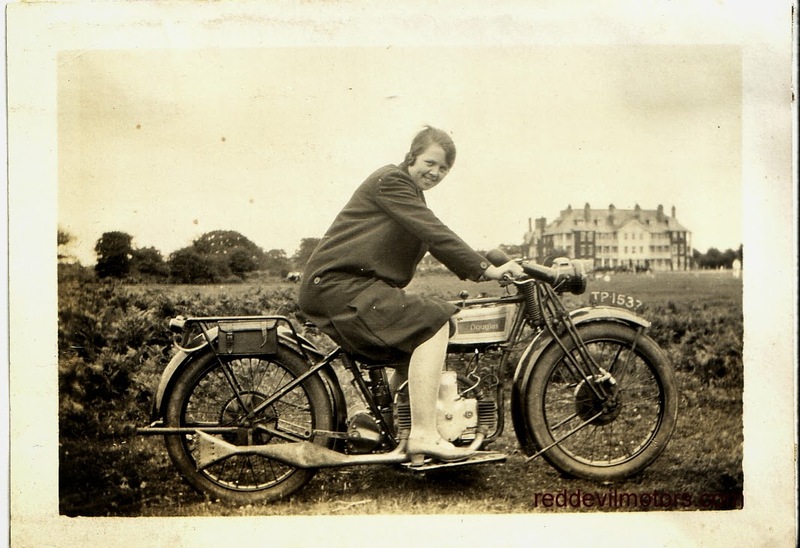 There are quite a few vintage Norton aficionados out there so hopefully someone will correct me if I'm wrong but I'm saying a Model 18 from 1930. 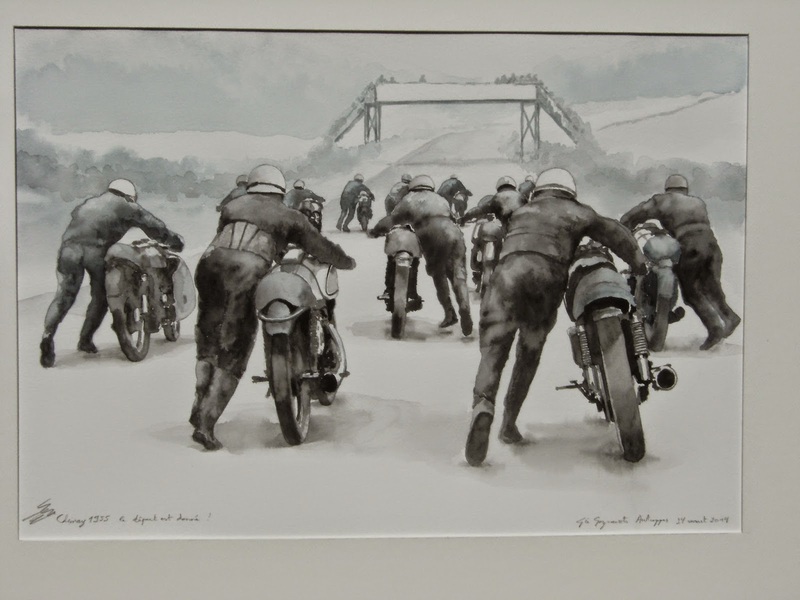 Terrible photo but interesting just to see the field in a late fifties / early sixties 250cc scrambles event. Looks to me like the majority of the runners are Greeves. Ear, ear! Loads of Greeves. The last couple of watercolours from Gie in Belgium. Thanks again Gie. 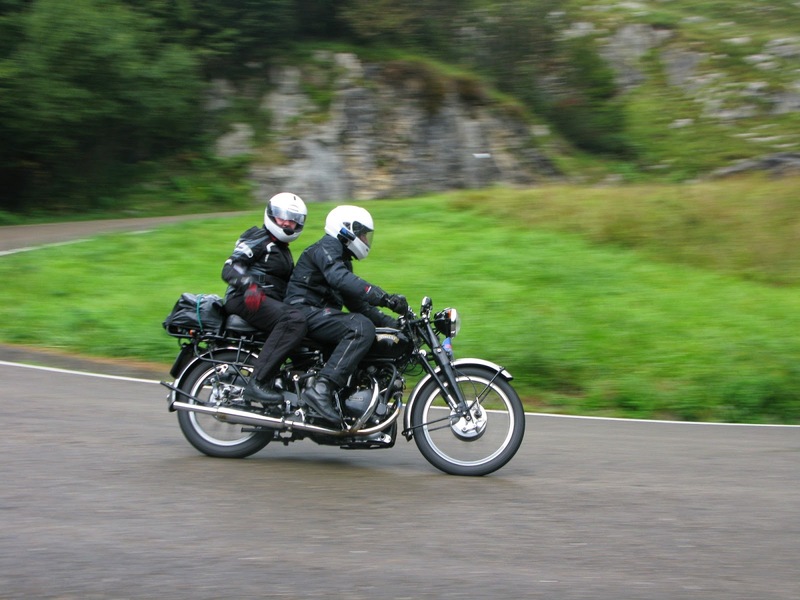 How did they both get there with the bike when it has no pillion seat? Period photo of a flat tank Douglas. I would guess the model as an EW and the year as 1927 though if there are any Douglas experts out there who know better please comment. 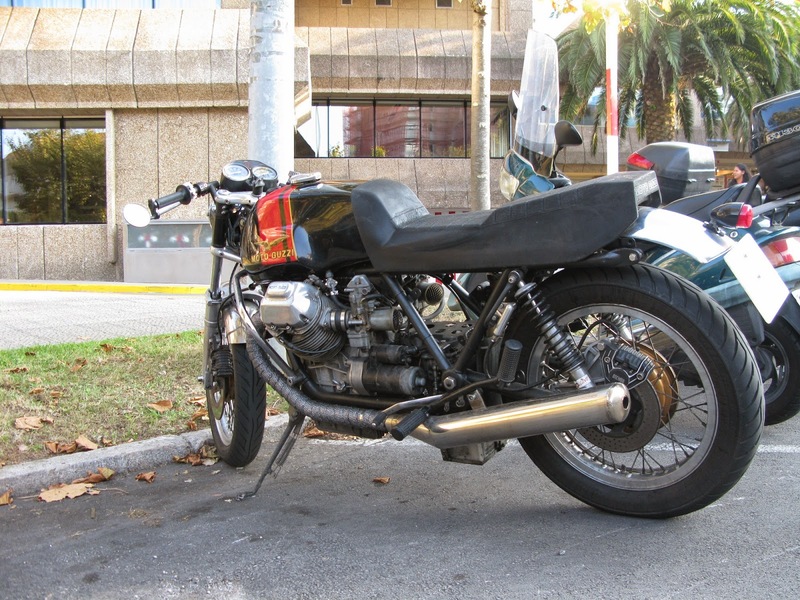 The EW was available as a 350 or 600, both fore and aft horizontally opposed side valve twins. Douglas flat tank EW model. 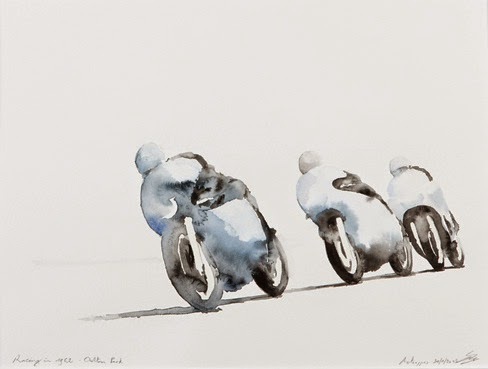 One more painting from Gie Goyvaerts in Belgium. This time a Rob North Trident. 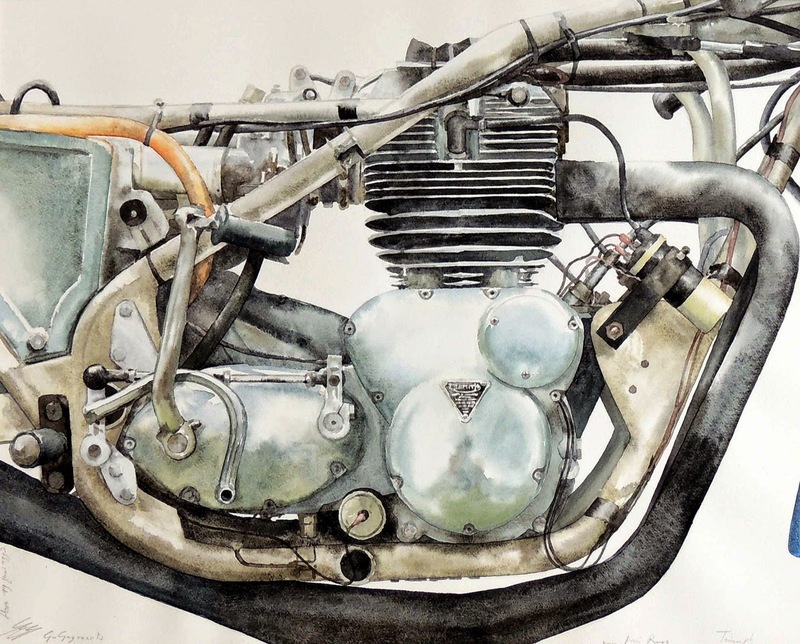 Rob North framed Triumph Trident watercolour. 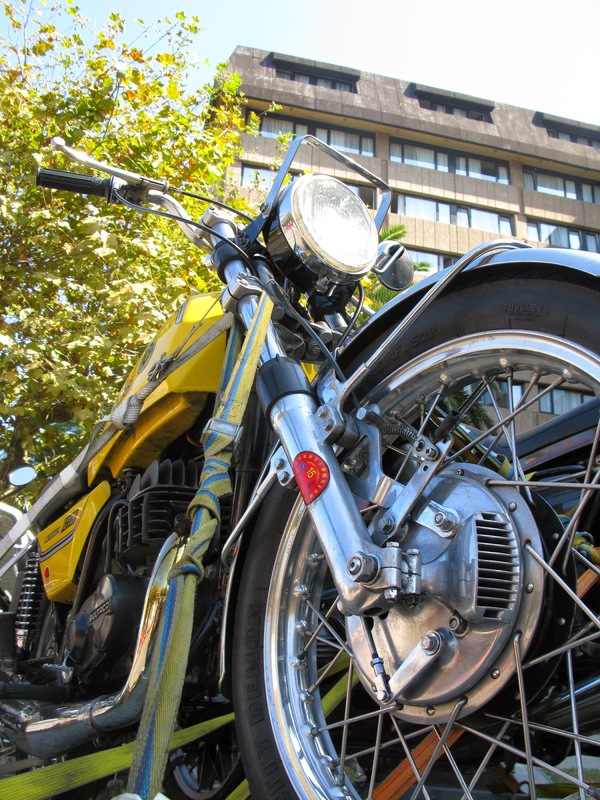 Many of the well known motorcycle manufacturers began with bicycles and in many cases continued with their cycle range alongside their powered two wheelers. 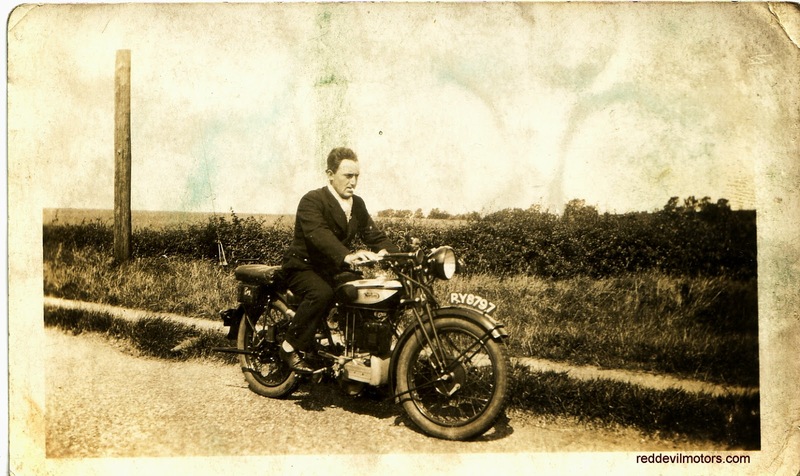 James was one such manufacturer and whilst they were never known for sporting motorcycles their bicycle range always had something for the clubman. 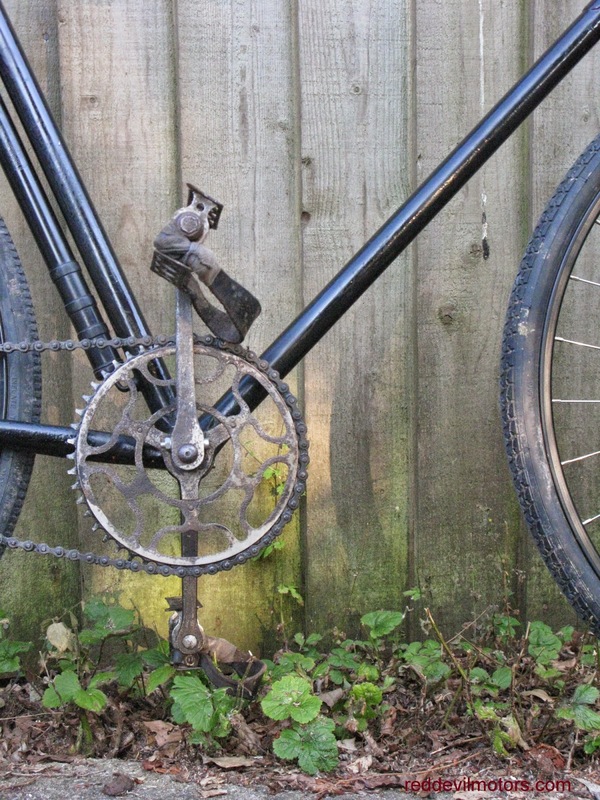 "This c 1923 James racer is a rare and important machine - it is one of the first factory built machines in the new lightweight style after WW1 - brazed up straight tapered chain and seat stays, 26in wheels and lower bottom bracket. This style copied from Bastide by the small lightweight builders immediately after WW1 spread to some of the bigger manufacturers such as James and New Hudson by 1923. 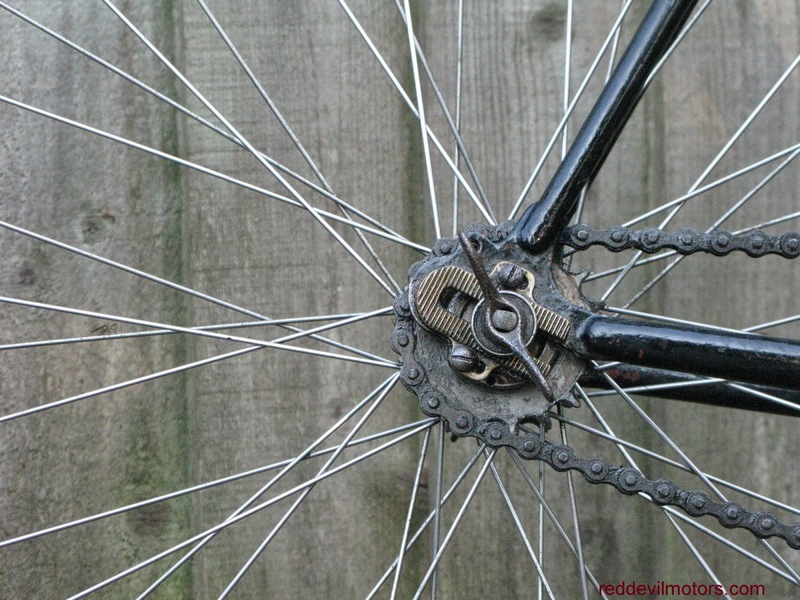 The special quick release was the fashion of the early 1920s; the fishtailed lugs were one of the many improvements adopted around the time." 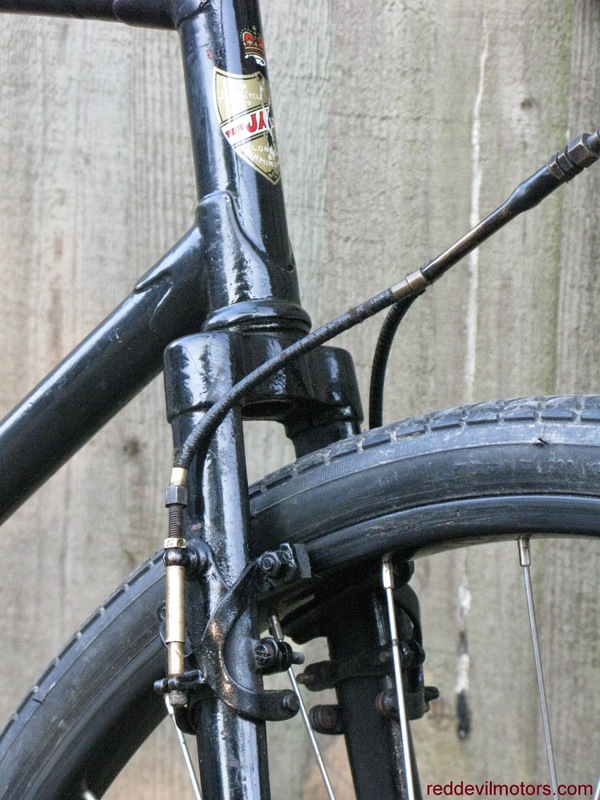 Points I would like to add are that the Resilion cantilever brakes are not an original fitment - they were not introduced until 1929. It is more than likely that the machine had no brakes at all when new, the addition is however a very sensible mod! The lamp bracket is a nice touch but the J on it stands for Jagrose (a cycle accessories brand) rather than James. The hubs are original though the rims have been replaced and respoked when the old ones rotted away and finally the toe straps are copies of originals. 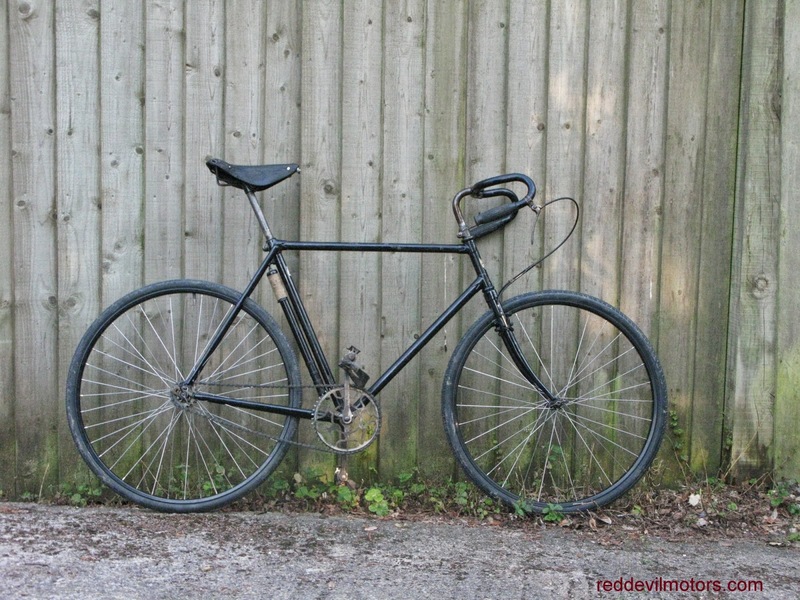 The James is a thoroughly useable bike if you don't mind fixies. 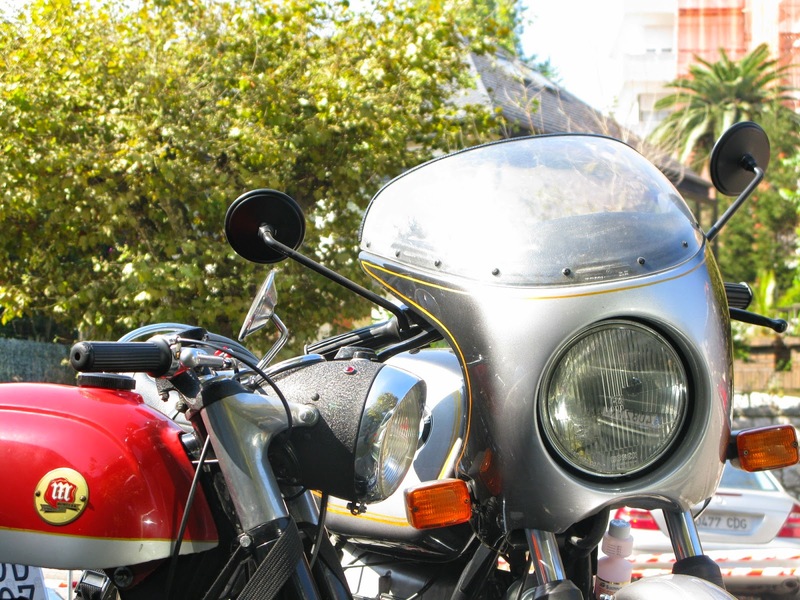 The ride is not significantly different from a machine thirty years its junior. 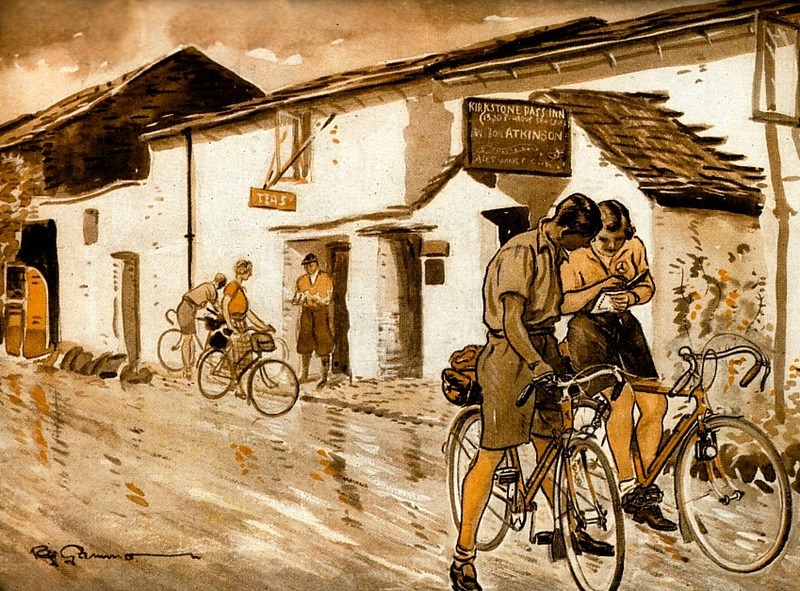 All in a fine piece of cycling history. 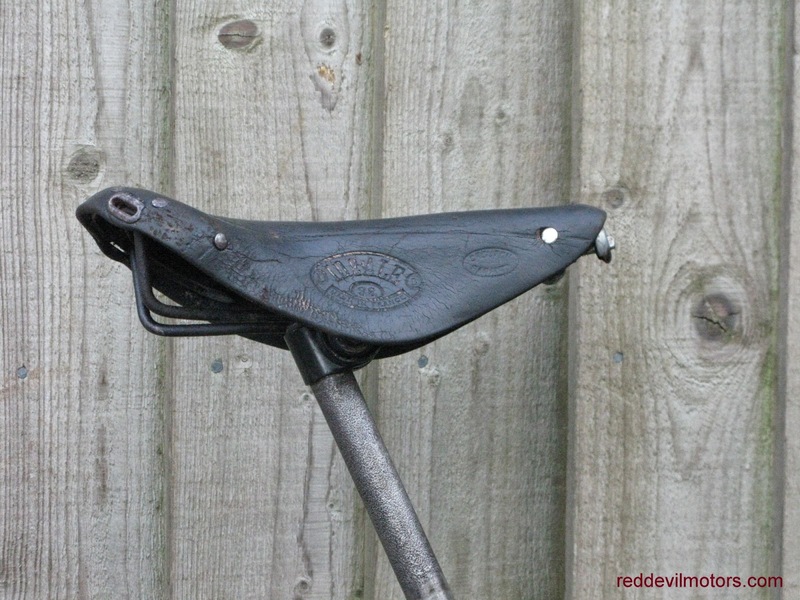 Well used 'Ideale' brand saddle. 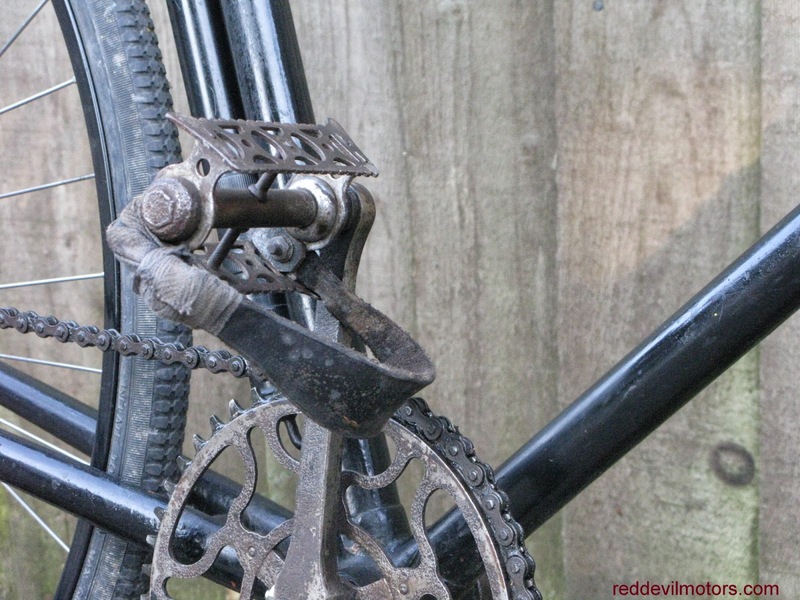 Neat serrated quick release chain adjustment. 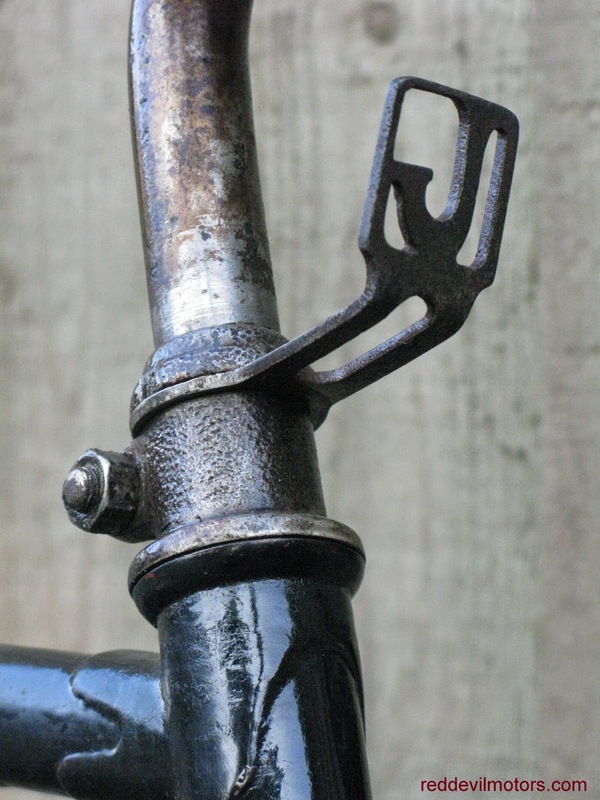 Lovely swan neck stem and curvy drops. 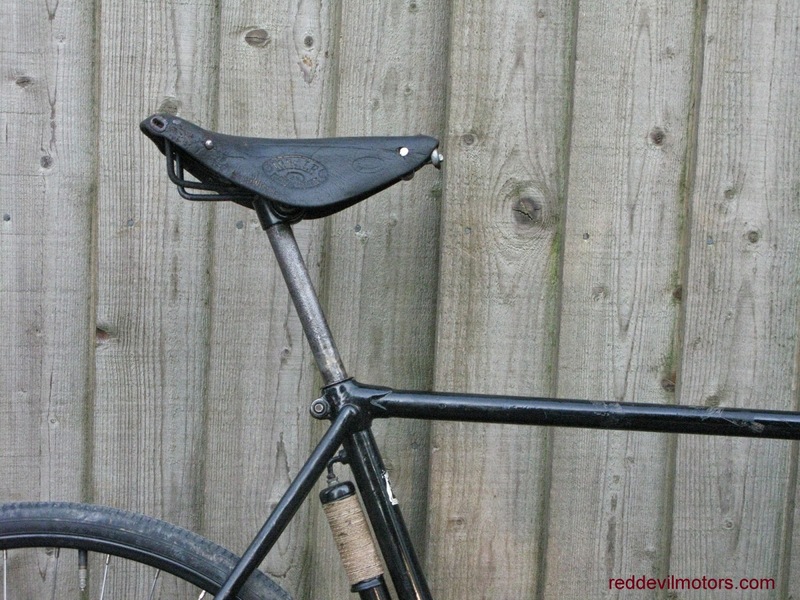 Seat post is very small diameter with adaptor fitted in frame.